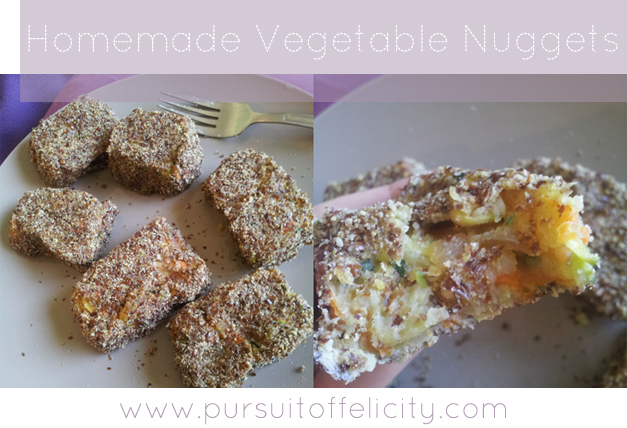 Pursuit of Felicity: Homemade Vegetable Nuggets Recipe. 1. Preheat your oven to 200°C and line a baking tray with baking paper. 2. Peel and cut your sweet potato into small pieces, then put on the stove to boil for 15-20 minutes. 3. While your sweet potato is boiling away, grate your squash, zucchini and carrot and place in a large bowl. 4. Finely chop up your onion and then cook in a frying pan with the minced garlic, ginger, salt and pepper for a few minutes. Once the onion is soft and appears translucent, scrape the onion into the bowl with the rest of the veggies. 5. Once your sweet potato has finished boiling, drain, mash and then leave to cool for a minute. Once cool, add into the same bowl as the rest of your veggies and thoroughly combine them using a wooden spoon. 6. In another bowl, whisk the egg, and then pour your LSA meal out onto a separate plate beside it. 7. Grab a handful of the veggie mixture and shape it into a large “nugget” like shape (the larger the nugget, the less LSA meal you will need). Dip your nugget into the egg mixture and then quickly coat in the LSA meal and place on your baking tray. Repeat this step until you've used up all of your veggie mixture. 8. Transfer your loaded baking tray into the preheated oven and bake for 15 minutes. 9. Once your nuggets have finished baking, leave to cool for at least 10 minutes as they will be very hot. Yum! Healthy nuggets :) you keep giving me more ideas for me to try! !